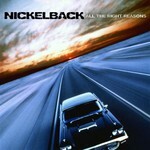 Fourth studio album from Nickelback is arguably their most dynamic and diverse yet. Produced by the band at Chad Kroeger’s home studio, All The Right Reasons continues where their massive debut, The State, left off. The band retains its core sound, but instead of playing it safe, touches on the edgier territory. Less polish and more attitude are welcome changes that fire up the rock numbers and give them more snap. There are lots of tortured emotions threaded throughout the 11 songs here. But where their previous albums roiled with anger there's a surprisingly large sentimental streak running throughout All The Right Reasons. Appropriately enough for an album that finds Kroeger's emotional palette opening up, Nickelback tries a few new things here, adding more pianos, keyboards and acoustic guitars to not just ballads, but a few of their big, anthemic rockers; they even sound a little bit light and limber on Someone That You're With, the fastest tune here and a bit of relief after all the heavy guitars. Multiple layers of chunky instruments and deeply personal lyrics dominate the set, none more so than on the single Photograph, which finds Kroeger at his hollering, triumphant best reflecting misty-eyed on lost love. The lyrics of this massive current hit may be fairly simple, but it's impossible to avoid getting caught up in the atmosphere of nostalgic reverie. Elsewhere Fight For All The Wrong Reasons echoes with textural guitars and evolves from a moody melody into crunchy, southern-tinged riffs. Side of a Bullet is rife with compelling narrative, while veers off in a heavier direction Pantera fans might even appreciate. However, the album's stand out moment is Savin' Me, a call for redemption driven by a combination of ringing fuzzy guitars and delicate piano. Potential hits abound: the lyrics and pace of Animals are equally racy and Next Contestant is a bar fight waiting to happen. And on Rockstar the band actually show off a too often hidden sense of humor about life at the top of the rock music heap. Overall, there is a lot of fun to be had on All The Right Reasons. On the heels of the release of their big hit single Photograph, Canadian band Nickelback deliver a strong, commercial album that sticks close to straightforward rock. Despite the wishes of a legion of critics All The Right Reasons makes a strong argument for lending another ear to Nickelback. The band has clearly grown. They show confidence in their ability to rock, hint at a sense of humor, and again demonstrate their skill at cranking out catchy melodies. Once the deserved success of Photograph dies down, look for more hits to come from this album. All The Right Reasons is easily their most effective and fluid collection of songs yet, there's a little something for all sorts of rock fans here.